President Trump proposed major changes to the federal student loan program in his first budget request to Congress. These include reforms to the Income-Based Repayment (IBR) program and the interest-free benefit on some loans for undergraduates. This paper offers a first look at the likely net effect of these changes proposed for undergraduate and graduate students (excluding the effects of eliminating the Public Service Loan Forgiveness program). 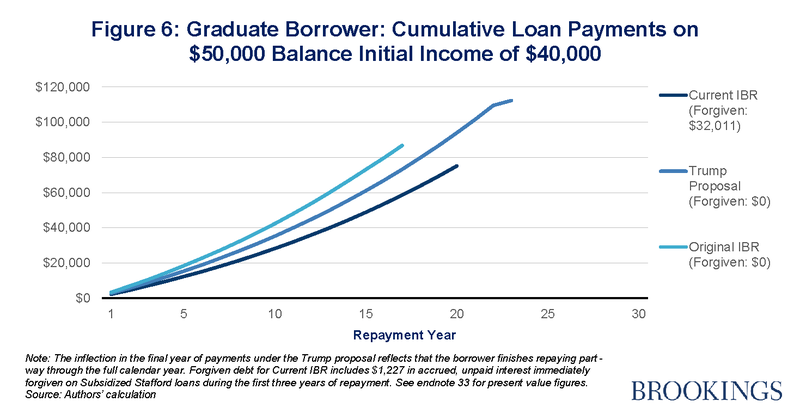 We use hypothetical borrower scenarios to compare how much borrowers with different loan balances would pay under the Trump proposal as compared to the existing program. Generally, we show that undergraduate students would receive a net increase in benefits relative to the current program due to earlier loan forgiveness. Those benefits are largest for borrowers with above-average debts and relatively higher incomes in repayment. The analysis also provides a reminder that graduate students can receive generous benefits under the current IBR program without having to earn a low income. The Trump proposal would substantially reduce benefits for graduate students below what they could receive under the current IBR program and even under the original 2007 version of IBR. Certain borrowers in the federal loan program have had the option to make income-based payments on their debts since the 1990s. However, this program was limited in important ways for most of its history and few borrowers used it. A series of changes between 2007 and 2012 made this option incrementally more generous and open to all borrowers. The changes helped transform the program from a little-used option into one that a quarter of borrowers choose today.1 All new borrowers in the federal student loan program as of 2014 can use the most generous version of this program, now called Income-Based Repayment (IBR), which sets payments at 10 percent of discretionary income and provides loan forgiveness for any unpaid balance after 20 years. At a campaign event in October 2016, then-presidential candidate Donald Trump announced that he wanted to allow borrowers to pay 12.5 percent of their incomes on federal loans and receive loan forgiveness after 15 years.2 But it was not immediately clear if his proposal would increase or cut benefits for borrowers because it would simultaneously reduce the length of time borrowers would be required to pay due to earlier loan forgiveness and increase the amounts they would pay monthly. President Trump reiterated this proposal in May 2017 as part of a more detailed set of reforms in his budget request to Congress.3 The details show that graduate students would clearly lose benefits due to a new 30-year loan forgiveness term – up from the current 20-year forgiveness term. Borrowers in certain public sector jobs would also see their loan forgiveness term increased with the loss of the Public Service Loan Forgiveness program, which we treat as a separate benefit and exclude from our analysis. While budget documents show that the net effect of the IBR proposal would reduce the cost of the loan program by $7.6 billion a year, that information left open the question about whether undergraduate students would gain or lose benefits.4 In fact, the budget added a further complication to that question: it included a proposal to eliminate the in-school interest benefit on a portion of loans for some undergraduates. This paper offers a first look at the net effect of these changes for undergraduate and graduate students and compares them to the existing IBR program. We use hypothetical scenarios to compare how much borrowers with different loan balances pay under the different terms. Generally, we show that undergraduate students receive a net increase in benefits relative to the current IBR program due to earlier loan forgiveness. In fact, the Trump proposal would create the most generous income-based repayment program the government has ever offered undergraduate students without regard to the type of job they hold.5 Graduate students, on the other hand, would receive loan forgiveness under the proposal in only rare circumstances, a major change from the current IBR program. In sum, the Trump proposal transfers benefits from graduate students to undergraduates. Before proceeding to that analysis, it is helpful to understand some of the key components of the loan program. Dependent and independent undergraduates are also subject to lifetime borrowing limits for both loan types. The lifetime limit for Subsidized Stafford loans is $23,000. For dependent undergraduates the lifetime limit for both loan types combined is $31,000. The limit is $57,500 for independent undergraduates. In the early 1990s, Congress added the first loan repayment plan that linked a borrower’s monthly payments to income, called Income-Contingent Repayment (ICR).11 Only a small share of borrowers used it. The plan was only available for loans issued directly by the government, which never accounted for more than one third of outstanding debt until 2010 (most loans were made by private lenders and guaranteed by the government until 2010). And, the terms resulted in monthly payments that were rarely lower than those available under fixed payment plans with extended terms beyond 10 years. We exclude ICR from our analysis. Congress enacted a new program in meant to replace ICR in 2007 called Income-Based Repayment (IBR), addressing two flaws in ICR.12 The new program was available to all borrowers regardless of loan type, and the terms resulted in lower payments than ICR. With IBR, borrowers paid 15 percent of their income above an exemption of 150 percent the poverty guidelines.13 IBR maintained the condition of loan forgiveness after 25 years of payments like under ICR. The program added a secondary cap on payments: no matter how high a borrower’s income might climb, monthly payments would never exceed those under a standard 10-year amortization schedule based on the original loan balance. The program also included a further benefit for Subsidized Stafford loans. These loans were protected from negative amortization (i.e., when the balance grows because payments do not cover accruing interest each month) for the first three years of repayment. Although IBR was enacted in 2007, it was not implemented until 2009.14 This paper refers to this plan as the original 2007 version of IBR. President Trump proposed his own set of reforms to the student loan program in his fiscal year 2018 budget request to Congress, including major changes to IBR that would apply to new borrowers.21 The proposal increases monthly payments to 12.5 percent of discretionary income, the midpoint between the original 2007 version of IBR and the current IBR program; it lengthens the loan forgiveness mark for borrowers with any amount of debt from graduate school to 30 years, but shortens the term to 15 years for borrowers with only debt from undergraduate studies; it abolishes the additional repayment cap set to a borrower’s 10-year payment schedule (a borrower can still switch into a 10-year repayment plan at any point, but would lose eligibility for loan forgiveness). Although they are somewhat separate from the changes to IBR, the proposal would eliminate Subsidized Stafford loans and Public Service Loan Forgiveness. Borrowers who lose eligibility for Subsidized Stafford loans can still borrow the same amounts through Unsubsidized Stafford loans; there is no net reduction in the amount students can borrow as a result of that change. We exclude changes to the Public Service Loan Forgiveness program in our analysis. Analyzing the effects of the Trump proposal for undergraduates is best done in three parts. First, we examine the elimination of Subsidized Stafford loans in isolation. Second, we look at the Trump IBR changes in isolation to illustrate how the 12.5 percent payment rate and the 15-year loan forgiveness term affect different categories of borrowers. Finally, we illustrate how the two policies combined affect borrowers. Eliminating Subsidized Stafford loans has a straightforward effect on those who would lose the benefit. Students leave school with more debt, all else being equal, assuming they borrow Unsubsidized Stafford loans instead. On those loans, interest that accrues during the in-school period is added to the balance when a borrower leaves school. If a student had qualified for the maximum lifetime amount of $23,000 in Subsidized Stafford loans during a five-year enrollment period, losing this benefit means he would have about $3,600 more in debt due to the accrued interest while still in school. Assuming a borrower repays on the standard 10-year fixed payment schedule, he would make $33,856 in total payments over the repayment term without the benefit versus $29,274 with it.22 This equates to an increase of $38 in the monthly payment. Less than 10 percent of students who borrow Subsidized Stafford loans borrow the lifetime maximum of $23,000.23 Those pursuing shorter-term credentials typically borrow around $7,000 in Subsidized Stafford loans in total and therefore add less than $1,000 in interest to their balances due to the loss of the interest-free benefit, which increases their monthly payments by $11 on a 10-year fixed payment schedule. While eliminating Subsidized Stafford loans reduces benefits, the changes to IBR increase benefits for many undergraduate students. This is because even though the borrower must make higher monthly payments under the Trump proposal, the earlier loan forgiveness is worth more in terms of reducing overall payments, not least because people tend to have higher incomes later in their careers. While it is difficult to gauge whether paying higher monthly payments in exchange for lower total payments under earlier loan forgiveness is optimal for all borrowers, we measure benefits by comparing what borrowers pay in total on their loans. We illustrate these effects by providing examples of borrowers with hypothetical loan balances and starting incomes. See the appendix for additional details about why we chose the examples and the assumptions we used in constructing them as there are important limitations to bear in mind. These examples are used to reveal differences between the repayment programs and are not meant to be representative of different groups of borrowers or those using IBR in particular, as little data exist on the income distributions of borrowers using IBR. However, the income levels in our examples are consistent with what little data are available and our examples would likely not be outliers of those using the program. Our first example is a borrower with $15,000 in Subsidized Stafford loans who earns a low income for the duration of the repayment period (starting income of $20,000 and a 4 percent annual increase). That debt level is approximately the median debt-level for a student who completes an associate’s degree with federal loans and about half the amount of debt for those completing bachelor’s degrees, making it a good proxy for the debt loads of those who drop out.24 Under the current IBR program, this borrower’s initial monthly payment is just $16 because his income barely exceeds the exemption of 150 percent of the poverty guidelines, $18,090. For the same reason, his payments under the Trump proposal are also low. But his payments would be 12.5 percent of his income above the exemption, not 10 percent, resulting in a monthly payment of $20. This borrower receives loan forgiveness under both the current IBR program and the Trump proposal because payments are too low to pay off the debt before 15 or 20 years. Besides the psychological benefit of making payments for five fewer years, the Trump proposal offers a clear monetary benefit. The borrower’s total payments under the current IBR program are $15,602; under the Trump plan they are $10,954 (see endnotes for comparisons in present value terms throughout this paper).25 Despite paying slightly more per month, paying for five fewer years yields a large benefit (see Figure 2). These savings are the same even if the borrower has more debt because payments are capped by income level. Borrowing more means the borrower has more forgiven. Meanwhile, the borrower’s total payments bear the same difference under the current IBR program and the Trump proposal. Savings under the Trump plan are larger for a borrower with more debt and a higher income. Consider a borrower with $40,000 in federal loans, a debt level at approximately the 75th percentile for students who borrow and complete a bachelor’s degree.26 A borrower with an initial income of $35,000 (with a 4 percent annual raise) makes total payments of $60,269 under the current IBR program, but only $48,498 under the Trump proposal.27 This borrower would receive loan forgiveness under both programs, but despite the higher monthly payments under the Trump proposal, the earlier loan forgiveness saves him nearly $12,000 over the repayment term, which is nearly $7,000 in present value terms (see Figure 3). Why are the savings so much higher for this borrower than the borrower in the first example who has less debt and a lower income? One might assume it is because the borrower has more debt. But recall that no matter how much more debt the borrower in the first example has, the additional benefit that the Trump proposal provides him is constant. His payments are based on his income under both plans, and because he qualifies for loan forgiveness under both plans, the amount he pays under each remains the same even if he borrows more. In fact, the borrower in this second example receives a larger increase in benefits under the Trump plan because his income is higher. Under the current IBR program, the borrower makes payments for 20 years, and in years 16 through 20 his income-based payments average $200 a month. Under the Trump proposal, the borrower doesn’t make those payments because the debt was already forgiven. Now compare that to the low-income borrower in the first example. Under the current IBR program, the borrower makes payments of just $77 per month during years 16 through 20. Savings under the Trump proposal are therefore $77 a month for five years for that borrower due to the earlier loan forgiveness, substantially less than the borrower with more debt and a higher income who saves $200 a month for five years. Next we combine the effects of Trump’s proposal to eliminate Subsidized Stafford loans with the changes to IBR. We have already described how a borrower who fully repays his loans (i.e., does not qualify for loan forgiveness under IBR) pays more in total due to the loss of Subsidized Stafford loans because the borrower leaves school with a larger loan balance that now includes accrued interest from the time spent in school. However, if the same borrower receives loan forgiveness under the Trump proposal, that additional debt is forgiven anyway. While the borrower leaves school with a higher loan balance under the Trump proposal, the extra interest is forgiven and then some if the borrower uses IBR: total payments under the Trump proposal are less than they are under the current IBR program with Subsidized Stafford loans. The Trump proposal delivers larger benefits even with the loss of Subsidized Stafford loans for borrowers who use IBR and qualify for loan forgiveness. We can illustrate this using the two earlier examples. For the first example, we treat the borrower’s $15,000 loan balance as Subsidized Stafford loans. To simulate the loss of that benefit we assign him a higher initial balance when he begins repayment to reflect the additional accrued interest. Under current law the borrower starts repayment with a $15,000 balance and repays it using the current IBR program; under the Trump proposal the balance begins at $16,950 and is repaid using the Trump IBR proposal. Despite the higher loan balance, the Trump proposal still results in lower total payments. In fact, his payments are the same with or without the benefit of Subsidized Stafford loans. The borrower’s total payments under the current IBR program are $15,602; under the Trump plan they are still $10,954 (see Figure 4). The amount forgiven under the Trump plan is, however, larger because the borrower starts repayment with more debt, but ultimately has it forgiven. We see the same effect for the borrower with $40,000 in debt. If he had qualified for the maximum amount of Subsidized Stafford loans over a four-year enrollment period ($19,000) his balance upon entering repayment would instead be about $42,470 after losing that benefit under the Trump proposal.28 But his total payments under the Trump proposal are still $48,498 and the higher loan balance simply results in him having more forgiven after 15 years of payments (see Figure 5). In effect, the Trump proposal largely maintains the interest-free benefit on Subsidized Stafford loans for borrowers using IBR but shifts when the interest is forgiven. Under current law interest is forgiven immediately because it never accrues. Under the Trump proposal, it accrues but is ultimately forgiven for borrowers who use IBR and do not earn enough after they leave school to repay it. 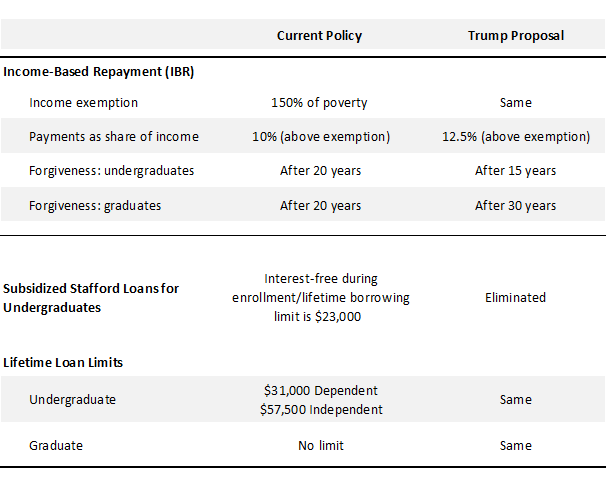 The Trump proposal also links the benefit to a student’s own income during repayment and only borrowers using IBR that have incomes low enough relative to their debt to qualify for loan forgiveness maintain access to the benefit.29 This is different from the current approach under which eligibility for Subsidized Stafford loans is based on a student’s family income when entering or while enrolled in school and the price that the school charges. Comparing the change in benefits for graduate students under the Trump proposal is more straightforward than for undergraduates. It is obvious that the plan reduces benefits relative to the current IBR program because it increases monthly payments by the same amount as for undergraduates, but instead of reducing the repayment period before loan forgiveness, it increases it from 20 years to 30 years. Higher monthly payments and longer terms must result in a reduction in benefits by making it far less likely a borrower would receive loan forgiveness. We have argued that the changes lawmakers made to IBR in 2010 provided outsized benefits to graduate students relative to the original 2007 version of IBR. While it is obvious the Trump proposal rolls back those benefits, we wanted to know if it would result in a less generous program for graduate students than even the original 2007 version of IBR. That plan set payments higher than the Trump proposal (15 percent of discretionary income) but provided loan forgiveness earlier, after 25 years of payments. Therefore, we include the original 2007 version of IBR as an additional point of reference in our analysis. The Trump administration’s student loan proposal outlined in the fiscal year 2018 budget addresses a number of problems in the current program. Most importantly, it rolls back the large subsidies that the Obama administration’s changes to IBR provide to graduate students. As this analysis shows, the Obama administration’s changes provide loan forgiveness to borrowers with graduate school debt even if they earn middle incomes, or high incomes if they have large enough debts. The case for providing a safety net to borrowers through IBR is sound, but the current IBR program goes far beyond that goal in the benefits it provides to graduate students. Graduate students already have a four-year college degree, which makes them a relatively elite group. Providing subsidies for graduate educations skews benefits to upper middle-class families while low-income families still struggle to finance an undergraduate education. The current IBR program is also likely to distort prices for graduate school and decisions students make about how much to borrow. The Trump proposal addresses these issues by removing the perverse incentive graduate students currently have under IBR to borrow more rather than less. Our example showed how a borrower currently would not incur any additional costs by borrowing $90,000 instead of $50,000. The difference would all be forgiven. And as the data show, $50,000 in federal student loans is hardly rare for a graduate student. It is the median balance for someone who completes a graduate degree. Such incentives are also likely to have a significant effect on the graduate education market, indemnifying students for taking on more debt than their future incomes can support and taking pressure off universities to offer only programs that have value in the labor market at prices in line with that value. The Trump proposal to eliminate Subsidized Stafford loans is another improvement over the current system. As discussed earlier, these loans add complexity to the student aid system by providing students with two sets of loans at the same time. And the interest-free benefits the loans provide are poorly targeted. Students from high-income families can receive them if they attend expensive colleges, and eligibility is based on a student’s or parent’s earnings when the student enrolls, not when the borrower begins repaying the loan. The Trump proposal solves all of these problems at once. All undergraduates are eligible for one type of loan when they enroll, but the cost of repaying those loans varies with the student’s income after he leaves school. Despite these improvements to the current loan program, there are downsides to the Trump proposal. In some ways, the proposal adds new complexity to the loan program. Establishing two loan forgiveness terms—one for undergraduate and another for graduate students—adds a new set of rules for students to understand and navigate. The Trump proposal also repeats the same mistake that the Obama administration made with its changes to IBR. By shortening the loan forgiveness term five years, borrowers with higher debts and moderate incomes reap the largest increase in benefits. The Trump administration has not provided a clear rationale for providing these borrowers with larger benefits that could be as much as $7,000 (in present value terms). 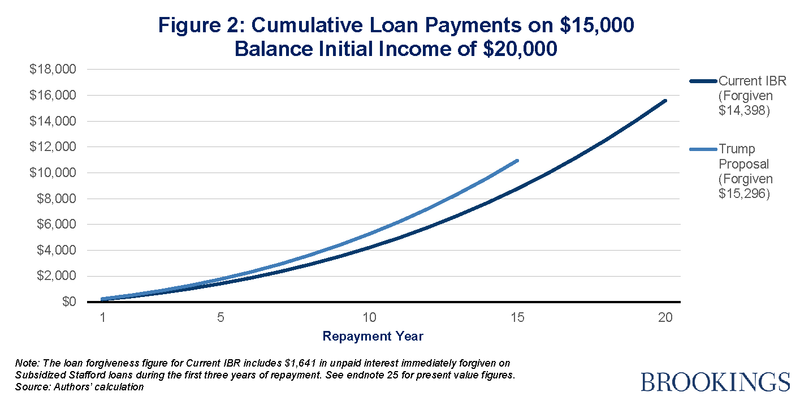 That said, providing borrowers who have small balances the opportunity for earlier loan forgiveness if they earn low incomes is an improvement over the current IBR program. It address one of the current program’s flaws—that graduate students with high loan balances receive the same loan forgiveness terms as undergraduates with low loan balances. But not all undergraduates have low balances and not all graduate students have high balances. The problem with the Trump proposal is that it increases benefits the most for undergraduate borrowers with relatively higher incomes and the largest debt loads. While the Trump proposal is clearly a net gain for undergraduate students and improves how some subsidies are allocated, it goes too far in providing additional loan forgiveness to borrowers who are more able than many to repay their debts. See the full report for the appendix. Kaitlin Mulhere, “Donald Trump Proposes Student Loan Forgiveness After 15 Years,” Time, October 14, 2016, http://time.com/money/4531134/donald-trump-student-loan-proposal/. White House, “Budget of the U.S. Government, Fiscal Year 2018,” www.whitehouse.gov/sites/whitehouse.gov/files/omb/budget/fy2018/budget.pdf. Undergraduates can qualify for larger benefits than the Trump proposal using the current IBR program if using the existing Public Service Loan Forgiveness program, which provides loan forgiveness after 10 years of payments under any income-based repayment plan. The Trump proposal would eliminate the Public Service Loan Forgiveness Benefit, a change we do not include in our analysis. Higher Education Amendments of 1992, Public Law 102-325. In the 2011-12 academic year, 82 percent of students who borrowed a Subsidized Stafford loan also borrowed an Unsubsidized Stafford loan that year averaging $2,992. Their average Subsidized Stafford loans that year totaled $3,555. Authors’ calculation using the National Postsecondary Student Aid Study 2011-12. In the 2011-12 academic year, 25 percent of dependent students who received Subsidized Stafford loans we from families that earned incomes above $80,000. The average cost of attendance at the colleges they attended was $22,238. Authors’ calculation using the National Postsecondary Student Aid Study 2011-12. For certain programs, such as medical degrees, students could borrow more. Deficit Reduction Act of 2005, Public Law 109-171. Omnibus Budget Reconciliation Act of 1993, Public Law 103-66. Under ICR, borrowers could elect to pay 20 percent of their income in excess of the federal poverty guidelines for their household size. The government would forgive any debt remaining after 25 years. College Cost Reduction and Access Act of 2007, Public Law 110-84. White House, “Budget of the U.S. Government Fiscal Year 2011,” www.gpo.gov/fdsys/pkg/BUDGET-2011-BUD/pdf/BUDGET-2011-BUD.pdf; Department of Education, “Fiscal Year 2011 Budget Summary and Background Information,” www2.ed.gov/about/overview/budget/budget11/summary/11summary.pdf. “Health Care and Education Reconciliation Act of 2010,” Public Law 111-152. Recently, researchers have shown that the original 2007 version of IBR helped reduce defaults, although they did not examine whether the more generous terms that became available in 2013 reduced defaults further. See: Holger M. Mueller and Constantine Yannelis, “Students in Distress: Labor Market Shocks, Student Loan Default, and Federal Insurance Programs,” NBER Working Paper, March 2017, www.nber.org/papers/w23284.pdf. Jason Delisle and Alex Holt, “Safety Net or Windfall? Examining Changes to Income-Based Repayment for Federal Student Loans,” New America, October 2012, https://static.newamerica.org/attachments/2332-safety-net-or-windfall/NAF_Income_Based_Repayment.18c8a688f03c4c628b6063755ff5dbaa.pdf. The increase in benefits for graduate students prompted the Obama administration to propose partially rolling back their own changes to IBR for graduate students, moving the loan forgiveness mark back to 25 years, but maintaining the lower payments set at 10 percent of income. Congress did not act on the proposal, and graduate students still stand to reap large benefits from the program. See: Department of Education, “Fiscal Year 2015 Budget Summary and Background Information,” https://www2.ed.gov/about/overview/budget/budget15/summary/15summary.pdf. Department of Education, “Student Loans Overview: Fiscal Year 2018 Budget Proposal,” https://www2.ed.gov/about/overview/budget/budget18/justifications/q-sloverview.pdf. For this analysis, we assume the example borrowers do not enter any hardship or unemployment deferments during repayment. Subsidized Stafford loans also do not accrue interest if the borrower enters a hardship deferment after leaving school while Unsubsidized Stafford loans do accrue interest. And our analysis does not factor in how forbearance benefits would increase accrued interest or loan forgiveness benefits. Authors’ calculation using the National Postsecondary Student Aid Study 2011-12. Expressed as a present value using a 2.0 percent discount rate, the figures are as follows: Total payments under current IBR are $11,986 and the forgiven debt is $9,689. Under the Trump proposal payments are $9,012 and the forgiven debt is $11,365. Expressed as a present value using a 2.0 percent discount rate, the figures are as follows: Total payments under current IBR are $47,578 and the forgiven debt is $9,741. Under the Trump proposal payments are $40,712 and the forgiven debt is $12,478. Among borrowers who completed a bachelor's degree in the 2011-12 school year and borrowed Subsidized Stafford loans at some point, about 25 percent borrowed $19,000 or more; 75 percent borrowed less than $19,000 in Subsidized Stafford loans. Authors’ calculation using the National Postsecondary Student Aid Study 2011-12. 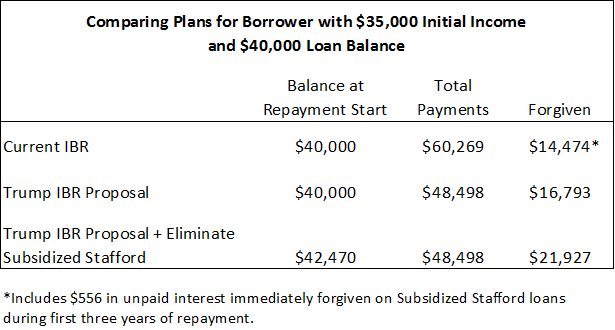 A borrower with a very low loan balance, such as $3,500, who qualified for a Subsidized Stafford loan and loses that benefit under the Trump proposal may not ever have that added interest forgiven under IBR because his income-based payments may be sufficient to repay the low balance before 15 years. He may still earn what some might consider a low income during repayment but one that is still high enough that IBR requires that he make regular monthly payments. In that case, the loss of the Subsidized Stafford benefit means he leaves school with a higher loan balance and does not have the excess balance forgiven. He ultimately pays it. If he uses a 10-year, fixed-payment schedule the loss of Subsidized Stafford loans could cost him as much as $500 in total additional interest payments. Another exception occurs for borrowers who are “on the line” for qualifying for loan forgiveness. They come close to repaying their full principal and interest balances in 15 years under the Trump proposal and have only a few hundred dollars forgiven. In these cases the borrowers end up paying more due to the loss of Subsidized Stafford loans than under the current set of policies; they do not qualify for enough loan forgiveness to have all of the excess interest they accumulate due to the loss of Subsidized Stafford loans forgiven. We assume $19,000 of the borrowers’ loans are Subsidized Stafford loans. They therefore each begin repayment with a balance $4,338 higher under the Trump proposal due to the interest that would accrue during a six-year in-school period that covers undergraduate and graduate enrollment. Includes $1,227 in accrued, unpaid interest immediately forgiven on Subsidized Stafford loans during the first three years of repayment. Expressed as a present value using a 2.0 percent discount rate, the figures are as follows: Total payments under current IBR are $59,442. Under original IBR they are $71,313. Under the Trump proposal they are $86,258. The present value of the forgiven debt under original IBR is $21,543. Technically, she pays for 17 years and one month. Forgiven debt for Current IBR includes $1,729 in accrued, unpaid interest immediately forgiven on Subsidized Stafford loans during the first three years of repayment. Expressed as a present value using a 2.0 percent discount rate, the figures are as follows: Total payments under current IBR are $59,442 and forgiveness is $81,355. Under original IBR payments are $120,966 and forgiveness is $34,099. Under the Trump proposal payments are $131,139 and forgiveness is $28,634.